Grab their attention, keep it, and have a great day! If you’re looking for substitute teaching inspiration, look no further! 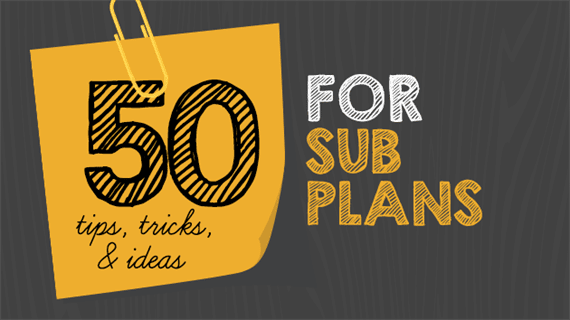 Whether you’re a seasoned sub or a total newbie, we’ve got you covered with these 50 tips, tricks and ideas from our very own WeAreTeachers HELPLINE! and around the Web. 1. Kids getting antsy with those last awkward ten minutes? Try one of these ideas from Love, Teach. 2. Stay on task, and leave a record. “Follow the lesson plans as much as humanly possible, leave detailed notes for the teacher about what got done or didn’t get done, which students were awesome and not so awesome, and leave your number if you really enjoyed the class.” —Dawn M.
3. Need a break? Try one of these quick popsicle-stick time-fillers from Journey of a Substitute Teacher. 4. If you don’t have anything nice to say… “Be pleasant in the faculty room if you eat there. Never say anything negative about the school, teachers, or students.” —Donna N.
5. Kids won’t stop texting? Put their phone in cell phone jail for the period. 6. Dress in layers. “Some rooms are freezing and some are hotter than heck!” —Edith I. 7. Don’t be afraid to be picky. “I have a list of teachers I won’t sub for because no matter what, they always seem to have ‘that’ class. In other words, not very good behavior management which means subbing for them is a nightmare.” —Eric D.
8. Subbing for second? Here are some quick and free emergency substitute activity ideas from Second Grade Locker Room. 9. We love these classroom management tips especially for substitutes from The Cornerstone. 11. … or a “just-in-case” bag. Check out suggestions for what to stock up on. 12. Act confident, even if you don’t feel it. “Fake it ‘til you make it!” —Tanya M.
13. “Find a trustworthy student to help locate or explain certain procedures.” —Heather R.
14. Read books about substitute teachers with the students. We love The Berenstain Bears and the Substitute Teacher and Miss Nelson is Missing. 15. Be honest. “If I didn’t understand the math lesson (2nd grade for example) then I would just teach them something math related. I may have them grab rules and count by two’s, five’s, measure items in the room, etc. I always leave a note for the teacher letting them know who was a big help, who I had issues with, what I got through on their lesson plans, and what I didn’t understand and improvised. Sometimes teachers know what needs to be taught and how, but it’s hard to explain on paper. I’ve never had a teacher tell me I should have just figured the math lesson out instead of teaching math my way.” —Hannah T.
16. Play free money games from the Measured Mom. 17. “Be flexible, and tell the students they need to be flexible. They may say they don’t do things a certain way, and I just tell them to be flexible and we’re going to switch things up today!” —Lloyd C.
18. Make feedback fun with these free, adorable “While You Were Out” templates from Teachers Pay Teachers. 19. Keep a sense of humor. Thanks, Key and Peele! (Disclaimer: Language makes this PG-13 for viewing). 20. Be strong early on. “Don’t be a pushover. Assert your authority early. You can always become a little more lax later, but they need to know they are not going to get away with stuff while you are there.” —Jillian E.
21. “Have a backup plan if possible. My plan was Boggle. It’s educational and quick to put on the board. It can be played as a whole class, teams, or small groups.” —Katie W.
22. Advertise yourself. “Make up a flier you can put in the teacher’s mailboxes to let them know about your experience and how to get a hold of you to sub. If you want to sub at one school in particular, put it in every mailbox.” —Jen M.
23. “Eat in the lounge and be the one to introduce yourself to teachers as they come in.” —Jay O. 24. Ask for help if you need it. “If you don’t understand a lesson, ask one of the other teachers. Not all teachers leave enough material planned. Have some extra activities that you can use as fill in.” —Leah W.
25. “I always have extra pencils and notebook paper.” —Grace K.
26. Make business cards. Distinguish yourself by leaving a professional business card with your report each time you sub for someone new, like this one. 27. Check out the YouTube Channel How to Be a Great Substitute Teacher. There are videos on starting class, discipline in different grades, and more! 28. Draw boundaries. “NEVER let students take anything off the teacher’s desk unless you know from the teacher what he or she allows, and ALWAYS leave a note for the classroom teacher!” —Laura R.
29. Dealing with a sassy child? Here are four tips to help from PopSugar. 30. “I have a mobile ‘desk’. I carry extra paper, pencils, post its paper clips, pens pencils, band aids, Tylenol…. Anything I might use because I don’t like entering a teacher’s desk if I don’t know them.” —Jennifer G.
31. Try rewards for good behavior. “I carry some small prizes. In middle school I use mechanical pencils. When I ask for them to help clean up, the most helpful ones get a prize! They remember and will cooperate better the next time.” —Seorin Y. 32. List your rules so they are visible to all students. 33. Check out these emergency sub plans from A Love For Teaching. They’re complete with templates based on the books Frog and Toad Together and Frog and Toad Are Friends. 34. Assign classroom jobs to students. “I always give the disruptive kids jobs! It helps them to focus.” —Jody H.
35. Work the room. “Being up and circulating always helps. Proximity is my best weapon for disarming mischief.” —Eloise P.
36. “Stickers are always good.” —Kathleen C.
38. “I always try to dress professionally but comfortably. I like to be dressed as nicely as the best dressed teacher.” —Lori Z. 39. “It’s all about your attitude. You can’t let them sense fear, nervousness or uncertainty. They feed on it!” —Jesse B. 40. Keep it clean. “Keep the room at least as tidy as you found it. Especially if you plan on going to that school regularly, you don’t want to be known as the messy sub!” —Megan F.
41. “I always bring a set of blank notecards so that even if the teacher doesn’t have a ‘feedback sheet,’ I can fill them in on how the day went. And thank them in the note for letting you have their class (no matter how the day went! ).” —Kim C.
42. Struggling to the the kids’ attention? Try one of these attention grabbers! 43. “Leave some sort of business card… more than just scribbling your contact info on a note. When I would get a call for a new school I hadn’t been in yet, I always left extra cards and said they could pass them out to others. Now that I am a teacher, I love when subs do that! It is so helpful. I am always looking for a sub who can keep the class going while I am gone, instead of taking my chances with a random sub!” —Jessica L.
44. You get to school, ready to go, and . . . the teacher didn’t leave lesson plans. Never fear—here are ten quick ideas for activities to do with students on the fly! 45. “Take control of the class so that you can get all of the lesson plan done. Lessons stack from day to day, so getting that day’s plans done helps the absent teacher in a tremendous way. When I was a sub, so many teachers praised the fact that I actually taught the lessons, and once word got out that I ‘got it all done’, I got called every day.” —Angelique P.
46. “It is courteous if you can grade papers or some type of feedback on student academic performance and to straighten the desk up leave everything there just make it look neat.” —Kimberly J. 47. How cute is this creative activity from First Grade Blue Skies? Find the freebie here! 48. “From a special education viewpoint, be firm, but please do not be so firm that students engage you in a power struggle. If there are aides, trust that they know the students and routines well. Let them help you.” —Jennifer W.
50. Above all… own the classroom! Check out the rest of our 50 Tips for Every Grade here.